You want your LTC Planning process with clients to be as productive as possible. To that end we’ve prepared two simple pre-qualification tools - a video and a flier - that can be sent to clients to prepare for the application process. 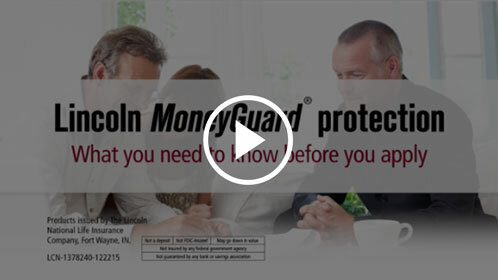 These tools will aid in their understanding of the Lincoln MoneyGuard® solutions underwriting process so it can proceed smoothly. Lincoln Financial Group is the marketing name for Lincoln National Corporation and its affiliates, including broker-dealer/distributor Lincoln Financial Distributors, Inc., Radnor, PA, and insurance company affiliates The Lincoln National Life Insurance Company, Fort Wayne, IN, and Lincoln Life & Annuity Company of New York, Syracuse, NY. Affiliates are separately responsible for their own financial and contractual obligations. Affiliates are separately responsible for their own financial and contractual obligations.